Explore Mayan caves and the world famous Belize Barrier Reef. Explore two sides of Belize: the Mayan archaeological sites as well as the pristine beaches and turquoise waters. The tours begins at the Cahal Pech Village Resort, where you'll spend the first two nights. It's a picturesque lodge with a grand vista overlooking the town of San Ignacio and the rolling hills of Western Belize. Hike into the jungle to the entrance of Che Chem Ha cave, explore the caves with their impressive rock formations and archaeological sites, and visit the Mayan Ruins of Xunantunich on the bank of the Mopan River. After departing Cahal Pech, you'll travel the scenic Hummingbird Highway to Dangriga, where you'll board a charter boat to the basecamp at Southwest Caye, on Glover's Reef. 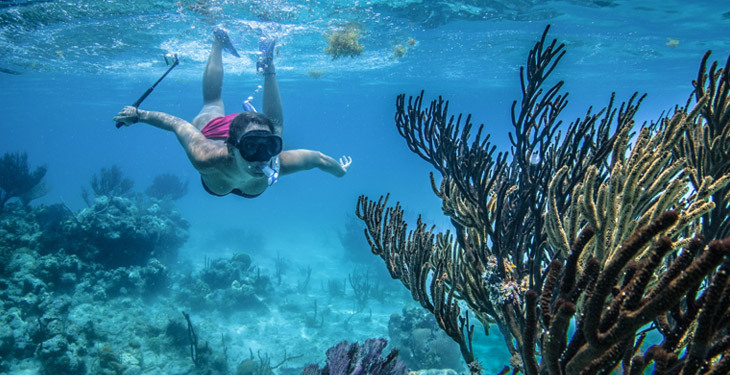 The reef is part of the world famous Belize Barrier Reef, a protected marine park and designated a UNESCO World Heritage Site, 36 miles off the shore of mainland Belize. Perfect for active families and couples of mixed abilities, this adventure basecamp offers flexibility and choices in daily guided activities, so traveling companions can do things together or separately. 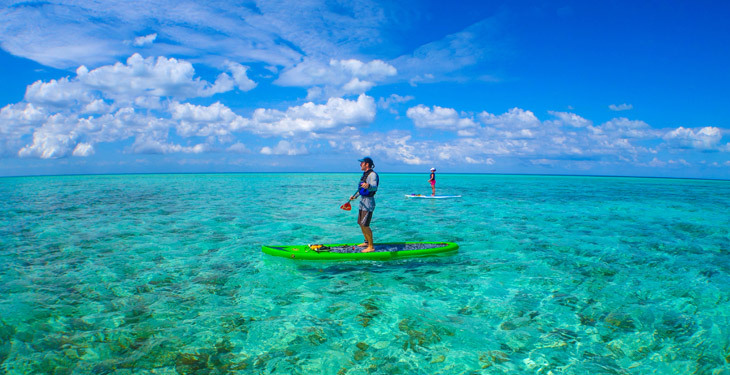 Kayak or SUP around this pristine group of tropical islands set within a turquoise lagoon, snorkel some of Glover’s 700 patch reefs with thriving coral reef systems, or fly fish for bonefish or tarpon on the saltwater flats and adjoining deep waters. Sleep in comfortable tent-walled cabanas and dine on fresh seafood, tropical fruit and local fare. Arrive at the Belize International Airport, where you'll be met by an Island Expeditions representative and transferred to Cahal Pech Village Resort - a picturesque lodge carved out of the land with a grand vista overlooking the town of San Ignacio and the rolling hills of the Cayo District in Western Belize. This is an ideal starting point for the adventure that awaits. This is the day to get in tune with the rhythms of Belize and acclimatize to your new tropical environment. Today is a full day of adventure and exploration. You'll begin by venturing into the jungle to explore the underground archaeological site of the Che Chem Ha cave system. You’ll hike half an hour through the rainforest, and up into a multi-chambered series of caves rich with geological formations, ancient ceremonial altars, and Mayan artifacts and relics. After an hour and half in the cave, hike further downhill to lunch served by your hosts in a spectacular setting overlooking the Macal River Valley. 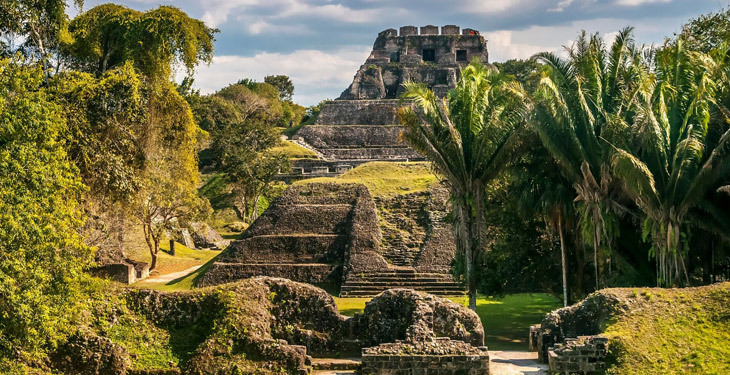 Your next adventure is the ancient Mayan ruins of Xunantunich. After a short drive, you'll cross the Mopan River on a hand-cranked ferry. Situated on the banks of the river, you'll travel back through centuries to the world of ancient kings, temples, plazas and the renowned ball courts of this ancient city. In the evening you can stroll into San Ignacio, meet the local people, and enjoy dinner on your own in the town. You’ll depart early in the morning and drive the scenic Hummingbird Highway through the rainforest to the coastal town of Dangriga. Here you'll board a charter boat to the remote Basecamp on Southwest Caye, located in the Glover’s Reef Marine Reserve. Upon arrival, you’ll receive an introduction to your new environment before settling into your ocean view tent cabana. Your guides will then conduct professional instruction to teach you the fundamentals of sea kayaking, snorkeling, and tropical water safety. 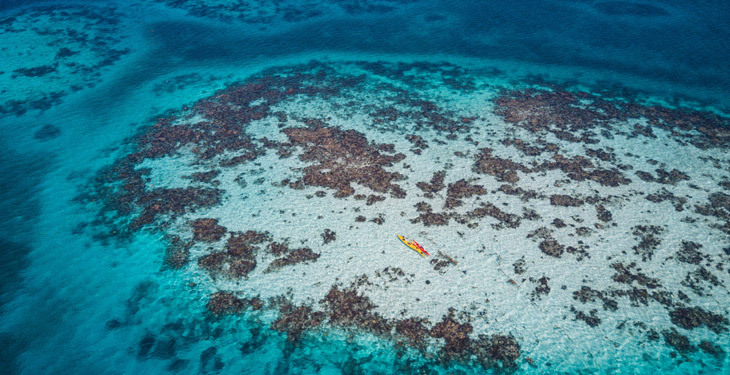 After training, enjoy a paddle to a nearby patch reef and start exploring some of the 700 snorkel sites Glover’s Reef Atoll has to offer. The itinerary is flexible in order to accommodate individual and group preferences. Activities include paddling, snorkeling the inner and outer walls of the reef, SUP and learning to sail a kayak. In the mornings and evenings, your guides will host informative sessions on a range of topics. This allows them to share their vast knowledge of Belize, its unique marine environments, and the local culture with you. Guests who prefer a more leisurely pace can always take time to kick back in a hammock and relax with a good book! Many guests choose to wake up early on this final morning to enjoy coffee on the dock for the last time. Watch the sunrise over the atoll before enjoying a hearty breakfast. Your boat charter usually departs around midmorning to take you back to the mainland, arriving approximately at noon. Your trip finishes in the Garifuna town of Dangriga, and the helpful tour staff will assist you with connecting to the next leg of your journey. For travelers who will be leaving Belize on Day 7, international connections out of the country require a departure after 3:00 pm. To connect with Sunday afternoon departures from Belize, a short domestic flight is required. This flight is from Dangriga to the Belize International Airport - please contact the Island Expeditions office for details. For guests who would like to spend an extra night in Belize, a flight and hotel package is available. 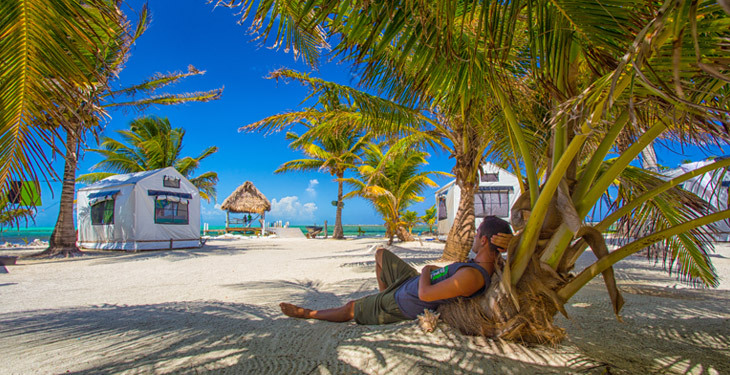 Island Expeditions’ Belize vacations are more than adventures and explorations in exotic locales. Along with skilled instruction in sports and activities, their trips are full of learning and interaction with the people, the land, the sea, and the wildlife of Belize. 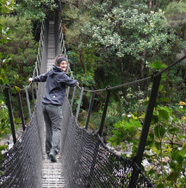 They also know that a great adventure is created from having first-class equipment, delicious meals, and small groups. You can be confident your participation in an IE trip generates funds to protect the wild places they depend on. Island Expeditions programs benefit and involve the local communities and generate funds that support conservation organizations. Keep doing what you're doing! You have provided my husband and me with a truly life-changing experience that we will remember always. The right words don't exist to properly express the feelings of peace and love we found on that island with our new family and life-long friends. Every person we met was amazingly friendly, I can't begin to express our gratitude to those that took us in and showed us the wonderful experiences Belize has to offer. Cahal Pech was great for its accessibility to William's cave and Xunantunich, but Glover's Reef obviously takes the cake when it comes to accommodations. "Paradise" doesn't even do it justice - I hope heaven is modeled after Glover's Reef. There is a minimum of 2 participants required per departure date. 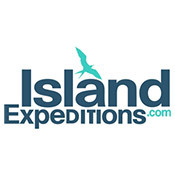 Please do not make travel arrangements until you have received confirmation from Island Expeditions. The trip starts In Belize City and ends in Dangriga. Guests must fly into Belize International Airport in Belize City (BZE). For travelers who will be leaving Belize on Day 7, international connections out of the country require a departure after 3:00 pm. To connect with Sunday afternoon departures from Belize a short domestic flight is required. This flight is from Dangriga to the Belize International Airport. If you need assistance arranging accommodations or domestic flights please contact Island Expeditions for options. Cahal Pech is a small 3-star Belizean-style resort. This picturesque lodge, carved out of the land, has a grand vista overlooking the town of San Ignacio and the rolling hills of the Cayo District in Western Belize. The hotel has a restaurant and pool onsite. Accommodations are in standard rooms with 2 double beds and are cozy, comfortable and equipped with flat screen TV and air conditioning. These tropically-styled rooms offer carefree vacationing. 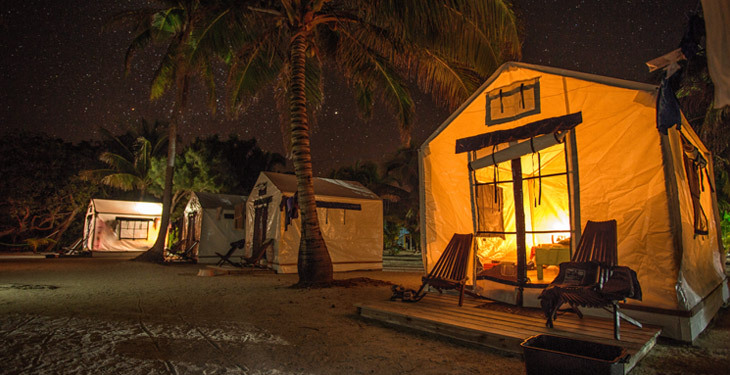 The Southwest Caye adventure basecamp is located in Glover’s Reef Atoll, a Marine Reserve, and a designated UNESCO World Heritage Site. The Atoll is 20 miles long by seven miles wide, encompassing a clear turquoise shallow lagoon with an estimated 850 coral heads and pinnacles rising to the surface. The camp is powered by solar generated electricity with freshwater showers, modern compost toilets and solar powered refrigeration. Guests sleep in comfortable wall-tent (safari-style) cabanas with wooden floors, a wooden night stand with a kerosene lamp, and outfitted with either single or double beds. Yes, single rooms are available. The single supplement is $275, payable at the time of booking. Group sizes range from 2 – 24 people. All meals from dinner on Day 1 through lunch on Day 7 are included, with the exception of dinner on Day 2. Meals in San Ignacio are provided by Ix'tabai Restaurant at Cahal Pech Village Resort offering a variety of Belizean and international dishes. All meals are provided during the stay at Glover’s Basecamp. Cuisine offered includes international, Central American, and local fare along with Creole dishes and smoked BBQ. Vegetarian or vegan meals are also available on request. If you’re planning to fly from Dangriga to Belize International Airport (Belize City), flights are approximately $100 each way. You should also account for additional meals and alcoholic beverages. You can budget an additional $200 for personal expenses. Also keep in mind that gratuities to your local guides are not included and are appreciated. Sunscreen - please consider bringing biodegradable reef-friendly sunblock & soap. Island Expeditions highly recommends the use of environmental products if you are certain the product works for you. Are there additional activities that customers can purchase? If so, what is the fee for each? All activities are included in this trip. For guest staying additional nights, there are a wide range of activities available in San Ignacio, with prices ranging from $45 to $185. Can I add additional nights in San Ignacio? Yes, based on hotel availability you can book additional night(s) prior the official start date of the trip. Book confidently with Free Cancellations within 72 hours of booking. After 72 hours, cancellation fees will apply. Cancellations are subject to the full discretion of Island Expeditions. For more information on our Travel Cancellation Policy please Click Here.